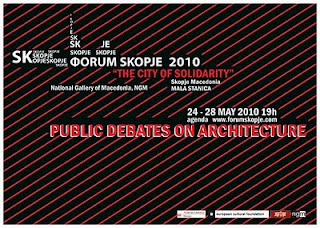 Artist and theorist Zoran Poposki will be speaking on "The Right to the City: Public Art and Activism" at the National Gallery of Macedonia in Skopje, on May 27, 2010. With Nika Grabar (Slovenia), Marko Golub (Croatia); and Stevan Vukovic (Serbia). Moderated by art historian and curator Nebojsa Vilic, the panel will discuss the complex intersection of ideology, politics and ethics through the relation between (state commissioned) public art and public space. 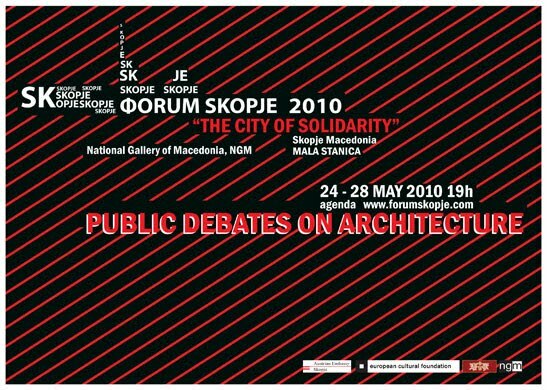 This public debate is part of the Forum Skopje 2010.